The tavern rumors promise adventure; the beacon in the dangerous wilderness promises respite; both are correct, and both lead to an abandoned monastery. 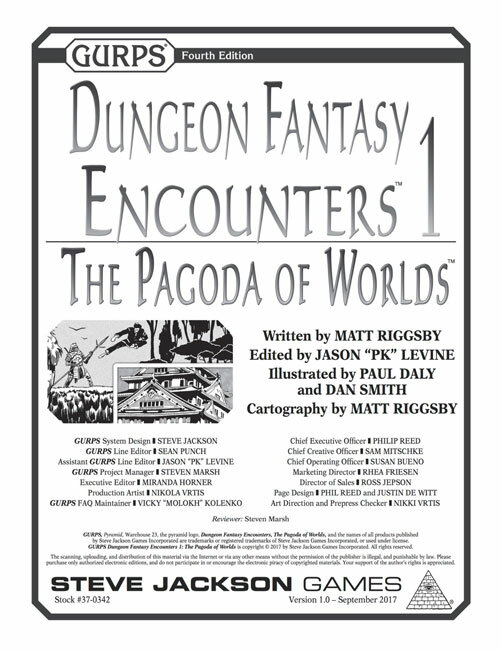 The Pagoda of Worlds is an ancient spiritual retreat holding many secrets and hazards for GURPS Dungeon Fantasy heroes . . . including the promise of a gate to other realms. 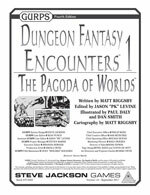 GURPS Dungeon Fantasy Encounters 1: The Pagoda of Worlds provides a ready-to-use detailed adventure outline, maps, new monster stats, and tips for adjusting the difficulty of events based on party size and composition. Open your mind, ready your sword, and prepare for battle; worlds await!